Bisi Bele Bath also popularly known as sambar sadam in tamil is yet another awesome and delicous recipe which my mom packs for lunch when i was little. I will finish a whole plate of sambar sadam with a side of fryums without even a single world. My mom always make freshly ground sambar powder ( a little special than the regular sambar powder Recipe) to make this Bisi bele bath recipe because the freshly ground masala adds a very good aroma to the recipe. This is the best way to incorporate all the vegetables in our daily diet so that we get all the benefits of vegetables. Whoever hates vegetables this is the must try recipe because the vegetables are nicely blended with rice and it leaves an awesome taste. I always love to add roasted cashews on the top to add extra crunchiness and taste. Please click here to watch Sambar Sadam recipe in Tamil in Madras Samayal. In a pressure cooker add rice and dal (wash it in water for a couple of times) . Add 4 cups of water to the rice and cook it for 4 whistles .We need to add more water to cook the rice because the rice needs to be cooked fully and it should be a little mushy. I like my sambar sadam to be mushy, if you want the rice to be more visible then reduce the cooking time. 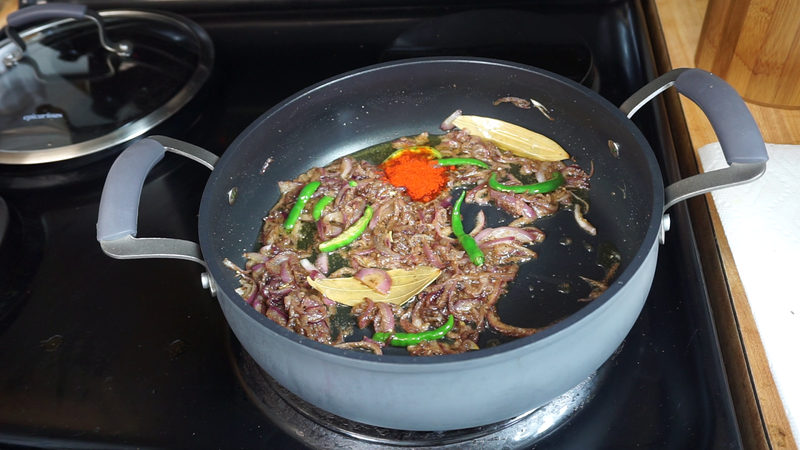 Heat a tsp of oil and add Chana dal, urad dal, coriander seeds, cumin seeds, pepper corns, fennel seeds, dry red chilies , kashmiri chilies to get nice color and roast it for few seconds. Then add grated coconut and saute it until coconut changes golden. Add the freshly ground sambar powder , water , little bit of salt and cook until the vegetables are fully cooked. Once the vegetables are 100 % done add tamarind juice. Soak a gooseberry size tamarind in water for 10 minutes and extract the juice. also add required salt and then add the cooked rice and dal. Mix it well to get rid of any lumps.Cover and cook it for another 5 minutes. Add the cashews, tempering and coriander leaves to the prepared sambar rice and mix well. Our Delicious sambar sadam is ready to be served. It tastes awesome with a side of chips or fryums and also with raitha. This recipe is very famous in every household in south India especially in the states of Andra Pradesh and Tamil Nadu. Add a tsp of fresh homemade ghee on the top of sambar sadam before serving, it will taste heavenly. Do not add too much of water while cooking the vegetables just add enough water to cook the vegetables otherwise the after adding the cooked rice it will take lot of time to get into the proper consistency. Adding nuts enhances the taste of the recipe. Bisi Bele Bath also known as Sambar sadam in Tamil is a very easy and tasty recipe which can be made at home. It incorporates flavorful, seasoned rice with lots of vegetables and nutrients.